The Court of Session in Edinburgh yesterday ruled in the case brought by Tilly Gifford against the UK and Scottish governments. The judge, Lady Carmichael, rejected the claim for the inquiry into undercover police activity to include Scotland. 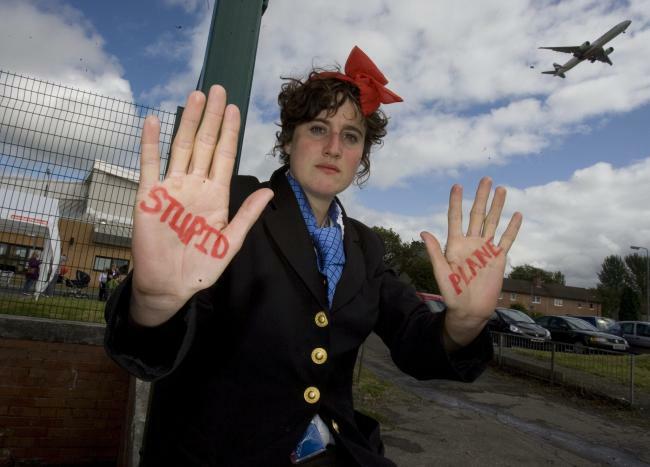 The Judicial Review was brought by Tilly Gifford, a climate activist who was herself targeted by the police for surveillance. The result means effectively that the police can act with impunity in Scotland. Peaceful activists have less rights in Scotland than they do in England and Wales. As part of their case, the claimant’s representatives submitted to the court an independent report on Undercover Political Policing in Scotland. This report documents the extensive interference and surveillance, over many decades and in many reputable and admirable campaigns and movements including trade unions. The report was rejected on procedural grounds. The case proves, once again, that Scotland is not at the periphery of the spycops scandal, but at the heart of it. It also raises significant questions about the role of Phil Gormley, which appear to be largely ignored by the Scottish media. Following the outcome of the Judicial Review, an alliance of people and groups affected by these issues in Scotland will now work together to campaign for a public inquiry in Scotland. This alliance includes blacklisted construction workers, people working with unions, miners from the strikes in the 1980s, environmental and social justice campaigners. Having read the full Court of Session statement it is clear that a significant body evidence was rejected as inadmissible. In particular the report (detailed in Sections 20-23 of the court ruling) by Dr Evelyn Lubbers was rejected on a procedural basis. It is of relevance as it contains evidence of undercover activities in Scotland and surveillance around the examples of G8, Pollok Free state, Faslane, and the Miners strike. Listen to “Spycops in Scotland: Tilly Gifford’s Judicial Review Nov 2018” on Spreaker. “We call for the Public Inquiry in Scotland to: appoint an independent Judge with a panel of experts with relevant life- and campaigning experience; for the cover names of officers to be released – for our files to be released; for an investigation into senior management and senior civil servants who authorised these undemocratic activities. This is just the latest in a long line of abuses of civil rights and of corruption in the police force. This has a long history. We now know that a body called the SPL (Subversion in Public Life) was established in the 1980s comprising senior civil servants, MI5 and Special Branch. This sought to control and blacklist trade unionists. We know that the police operated illegally in Scotland for a sustained period of time, and that this invasion of civil liberties is being ignored and covered-up. We know that the former Chief Constable, Phil Gormley, sanctioned deep cover infiltration by spycop, Mark Kennedy, who deceived environmental activist, Kate Wilson, into an intimate relationship. We know that the bulk of the Scottish media’s focus on Gormley’s activities is on him being rude, or inappropriate at work, rather than being at the heart of undercover policing. We know that Mark Kennedy visited Scotland at least fourteen times. We now know that there has been undercover policing in Scotland, and it needs to be investigated by an independent transparent public inquiry. This is a democratic deficit and a disgrace. As the world faces climate breakdown what are we doing to the young people who are standing up to the crisis? We are framing them, harassing them and then covering it up. When I used to talk to friends and family about the fragments of this story that I was hearing and reading about, and the extent to which the surveillance state was bring quietly rolled out, I found that psychologically people didn’t want to hear it or belive that the nations “peace keeps” could be up to nefarious entanglement’s. It was too challenging to peoples’ conditioned world view, that they were so invested in. People would usually tell me I was indulgence in conspiracy theories, as they have been conditioned to do by the MSN etc. I was putting together fragments of evidence into a theory that: some people in positions of authority were conspiring to shape the domestic political landscape of the UK and world in general. A recognised conspiracy fact now. If more people would openly analysis what is going on in the world we might actually be able to shape thing for the better, rather than giving our power and future away and then try to claim a pittance in composition from the system that we just allowed to become corrupted to work against us. For example, was 911 a conspiracy? Yes. But the US/UK elites want you to believe that it was an Arab conspiracy. Look at the evidence? The chair and panel of the official 911 Commission say that their work was set up to fail, the main architect says the buildings could with stand multiple impacts from jetliners, the money trail leads to western interests, the airforce was in disarray, the war on terror has been the best thing that has ever happened for arms manufacturer and western elites who want to counter progressive forces in the west, western foreign policy agenda has been achieved There are mountains of evidence that point to a western conspiracy from inside our compartmentalised and corrupted institutions. Show me even one bit of material evidence that supports the official conspiracy theory. The war on terror has been a disaster for people in the Middle East, and our naivety self deception is to blame. We need to get much more informed and smarter to work for change. I’m talkong to you Scottish independence movement. Incidents like this only serve to undermine all the good work by 99.99% of our ordinary bobbies on the beat while at the same time making us think twice before reporting incidents which need to be reported. If we were honest we know that in this age of universal terrorism as distinct from ‘Patriotism’ the police do need to undertake covert operations but they, the police, must never be placed in situations where the officer, their families and for that matter those being investigated are placed in possible compromising situations by senior officers. Therefore we still need a full inquiry in Scotland into the activities of Phil Gormley and certain other named officers. You’ve presented the fairytale version of how things are, and that a certain segment of the Police Force uphold. But things are much more complicated and you really need to explore the history of, and define what you mean by, “universal terrorism”. As a shop steward for the AUEW (constr section) in the 70’s and 80’s working at Nigg Fabrication Yard I was involved in the organisation of a strike which resulted . due to changes in legislation (remember Tebbit and Thatcher) in the sacking of the entire workforce of around 4,000. During the period I was pursued by police through the streets of Tain having gone off with a copy of the new conditions the company wanted to impose. Durind the period of the strike my own phone was making funny clicks and I presumed it might be tapped but it was clarified to me when the local Police Inspector asked me about the content of a phone call that evening, while we were both at a meeting of the Community Council (I as a Councillor, he to give his monthly report). Some time during this period some workmates came round to my house to make a banner and decide on future action when someone knocked at the door. A youngish man in a tweed sports jacket introduced himself as a police detective and asked if he could look out of my back window since there had been a break in at the co-op which could be seen from there. He obviously was not interested in the view so I introduced him to my friends and told him what we were doing and he went off. The co-op manager denied any knowledge of a break in the next day. Soon after the dispute, when everyone was taken back under the old, original terms of employment the Sergeant who had chased me, who I actually knew personally, retired and was employed at the Nigg yard as Industrial Relations Officer, and we all knew where he was sending files on “trouble makers”. I have often wondered what was in my own file and how it affected my working life after that. To me this decision is so obviously not based on reality but the obfuscations of the legal process. I assume that one function of all this secrecy is to deny whistleblowers credibility (their identity, roles and orders would have to be public or provable, otherwise they could be disavowed). The concept of a (public) right to the truth is an interesting one. Might the right to self-determination require a certain right to truth that would apply in this case? So what are the Scottish Government saying about this. Not very much from what I can see. But neither are they saying much about independence either these days. Westminster’s ‘devolved’ so-called ‘Scottish Government’ still remains under the control of Whitehall’s finest. One can only be sure of the allegiance of all of Scotland’s public officials to Scotland and only to Scotland upon independence and subject to oath taking that reflects such allegiance to Scotland as an independent country. Until then all public officials in Scotland must have allegiance to Westminster. The so-called ‘Scottish Government’ does not therefore necessarily act in Scotland’s interest, irrespective of who sits in Holyrood. Reflecting on the ever increasing surveillance that is the UK state, and it’s desire to install a smart border in Northern Ireland, this quip from @borderirish is very apt. – am as beautiful as the setting sun. Yes, smart all right, and no doubt why Westminster is currently putting through legislation that will allow the stopping, searching and detention of anyone within one mile of, or at first train stations from the border. Just the ticket for places like South Armagh and other border regions. They’ll just love it and will very possibly welcome these spycops with – open arms! Just saying like. Democracy works in mysterious ways. Actually, in the event of a hard border, things will revert to how they were before the cease-fire and treaty. Irish people are enraged at the arrogant way they have been ignored and mistreated, and the treaty itself violated. In the event of a hard border, a lot of innocent people are going to suffer, just due to the arrogance of the UK elite and dep state.